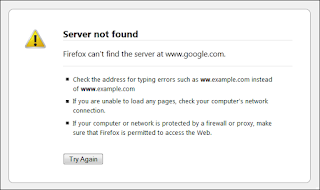 A “Server not found” error in Firefox or “Google Chrome could not find [website.com]” message indicates that your browser could not find the website you’re trying to access. Either you mistyped a website address and you’re trying to access a website that doesn’t exist, your DNS server is down, or your firewall, proxy, or other settings are misconfigured. 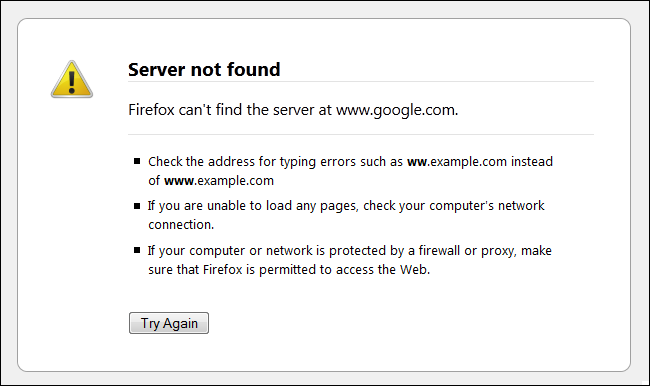 The “Unable to connect” error in Firefox or “Google Chrome could not connect to [website.com]” message looks similar to the “Server not found” message above, but each means something different. if you see this message, your browser has successfully contacted its DNS servers and identified that there should be a website at the target location. However, your browser did not receive a response from the website’s servers when it tried to connect. If you see this message, it’s possible that the website itself is down or experiencing problems. You may want to try Down For Everyone Or Just For Me, a website which tells you whether a website is down or if you just can’t access it. It’s also possible that your firewall, proxy, or other network settings are misconfigured. 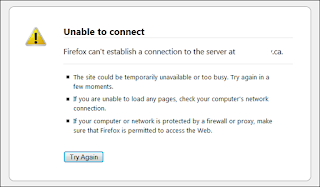 You may see a variety of web server messages when accessing web pages. The most common one is “404 Not Found,” which means you’re trying to access a page that doesn’t exist. Either the web page was removed or you were typing in an address and mistyped it. These error messages are generated by the remote web server and sent to your browser. If you see these, double-check the web page address you typed. If you clicked a link, the link was in error – or the page it points to has been removed. An SSL certificate error or security certificate error indicates a problem with HTTPS encryption. 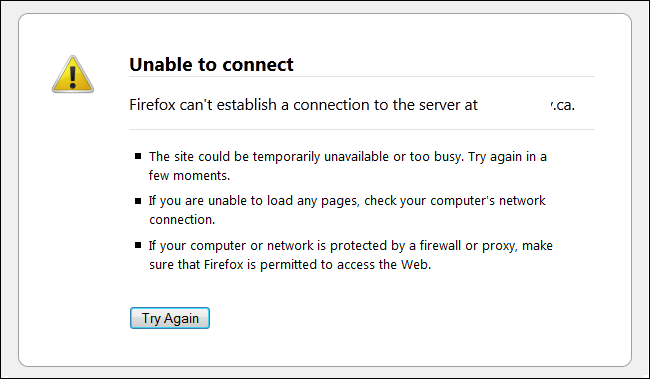 You’ll only see this error when connecting to a website using HTTPS. When using HTTPS encryption, websites present certificates to identify that they are legitimate. 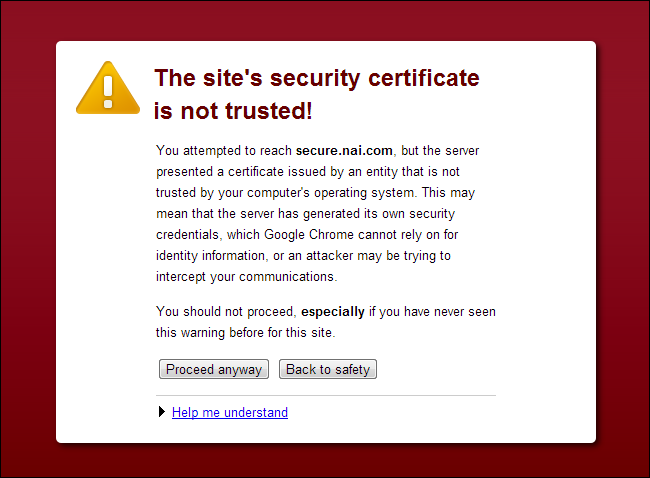 For example, Google.com has a security certificate issued by a trusted certificate authority. The certificate authority verifies that Google is the real owner of Google.com and is entitled to the certificate. When you connect to Google.com using HTTPS, Google presents this certificate. Your browser checks that the certificate was issued by a known legitimate certificate authority to verify you’re connecting to the real Google.com, not another server pretending to be Google.com. When you see a certificate error, this indicates that you’re not necessarily connecting to the real, legitimate website. For example, if you try to access your bank’s website on a public Wi-Fi network and see this error, it’s possible that the network is compromised and someone is attempting to impersonate your bank’s website. However, it’s also possible that a website failed to properly renew or configure its certificate. Either way, you shouldn’t continue when you see this error message. 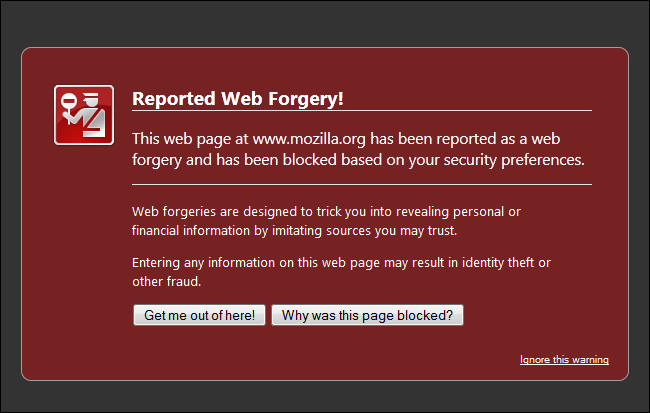 Your browser will also display phishing (or “web forgery”) and malware warnings. 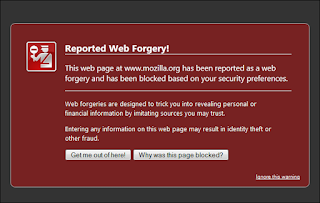 Whether you use Firefox, Chrome, or Internet Explorer, your browser regularly downloads a list of dangerous websites. When you attempt to connect to a website on this list, you’ll see an error message. Websites are placed on these lists because they contain malware or because they attempt to impersonate a real website to steal your passwords, credit card numbers, or other sensitive information. In some cases, a website may temporarily be added to this list because it was compromised. When the website is fixed, it should be removed from this list. When you see this message, you shouldn’t continue.